The theme for World Breastfeeding Week 2015 is "Breastfeeding and Work: Let's Make It Work! ", calling attention to the importance of supporting moms who pump & work. The world's oldest eating trend is having a moment. You can't turn on the TV or hit up your favorite social media channel without seeing a beautiful celeb brelfie (breastfeeding selfie – see Alyssa Milano or Doutzen Kroes), a proud article by a mom who chooses to extended-nurse her toddler, or a TEDx talk featuring a mom nursing on stage. Most of the national conversation has been empowering for breastfeeding moms, but last week's blow-up over Donald Trump's alleged insults to a pumping mom reminded us that not everyone thinks breast milk is the key to eradicating global disease, ending world war and patching up the American economy. The timing of the Trump story coincided perfectly with World Breastfeeding Week, an annual worldwide effort to support—you guessed it—breastfeeding. This year's WBW theme, "Breastfeeding and Work: Let's Make It Work! ", is dedicated to calling attention to the importance of supporting women as they attempt to balance breastfeeding and career. "Whether a woman is working in the formal, non-formal, or home setting, she needs to feel sufficiently empowered to claim the right to breastfeed on behalf of both herself and her baby," say the forces behind WBW 2015. It's all too often that we hear stories of female workers forced to pump in a bathroom stall, or managers who refuse to let their employees take breaks to pump at all. Thankfully, the tide has been turning as of late, with more and more companies offering an inventive array of workplace perks for their nursing and pumping employees. At Rotary International's Evanston, Ill. Headquarters, a dedicated room houses a full-sized fridge (stocked with a Brita water filter for thirsty pumpers), computer, floor-to-ceiling storage cabinets for stashing pumping equipment, controlled lighting, multiple drying racks, and Seventh Generation soap. Our favorite part? Rotary's "Baby Brag Wall," featuring a collage of 30-40 photos and birth announcements from mini Rotarians. "Rotary has supported numerous maternal and childhood health programs around the world, so it's only natural that we'd want to provide the healthiest atmosphere for breastfeeding moms at our international headquarters," explains John Hewko, general secretary of Rotary International. "Our lactation room gives breastfeeding moms at Rotary a clean, comfortable and private place to pump—cutting down on the stress and anxiety often associated with finding somewhere to pump in the workplace." CARE, a leading humanitarian organization fighting global poverty, cares so deeply about maternal health (one of the key focuses of their work) that its Atlanta headquarters goes so far as to allow staffers to bring their babies to work for the first six months to encourage nursing. According to the Pan American Health Organization/World Health Organization, working moms who feel supported in their nursing endeavors are happier, more dependable and productive employees. Studies show that companies that promote breastfeeding in the workplace enjoy greater employee loyalty, retention and productivity, as well as reduced absenteeism (because breastfeeding employees' little ones get sick less often). Paid maternity leave is another important perk worth fighting for. According to Amal Omer-Salim, Ph.D., senior technical advisor of The World Alliance for Breastfeeding Action (the organization behind WBW 2015), paid maternity leave allows women more time to comfortably establish a breastfeeding relationship with their child; these children "have better attendance at well-baby visits, higher rates of immunizations, lower rates of infant mortality and improved early brain development." Paid leave also boosts maternal mental and physical health, with these moms suffering fewer respiratory infections and less depressive symptoms. Diana West, IBCLC, director of media relations for La Leche League International, says the best move an employer can make is to be proactive when it comes to encouraging working moms to keep up their breastfeeding efforts. "Mothers shouldn't feel like they have to beg for [help]," West says. "They deserve the option to pump in a private place, with enough time to do so, in a way that does not call attention to what they're doing. That's a very positive way for companies to facilitate pumping during the day, so [women] can become more effective employees in the workplace." West encourages employers to visit the U.S. Department of Health and Human Services' Business Case for Breastfeeding website, designed to help companies foster breastfeeding-friendly work sites. The website outlines some of the impressive but little-known returns on investment when it comes to creating a pro-lactation work environment, such as lower medical costs and health insurance claims for nursing employees and their infants (up to three times less for breastfeeding employees) and up to half the number of single-day absences. As for female employees who find themselves stuck pumping in the parking lot because their lactation room has four toilets and a tampon dispenser in it? "You have the right to request anything that can make your efforts to continue breastfeeding while employed easier," West encourages. "There's usually no harm in asking and a lot to be gained." World Breastfeeding Week is celebrated every year from August 1-7 in over 176 countries. 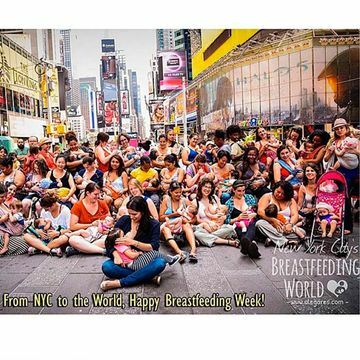 Photo: More than 100 babies and toddlers breastfed from their mothers at the same time in New York's Times Square on Sunday morning as part of the "Global Big Latch On," which saw breastfeeding demos all over the planet to kick off World Breastfeeding Week.